Misunderstandings about changes in employee payroll status can be a frequent source of friction, and can result in disruption of work, low employee morale and even costly litigation. Head off these consequences before they arise with an employee payroll form that documents all the changes when they're made. 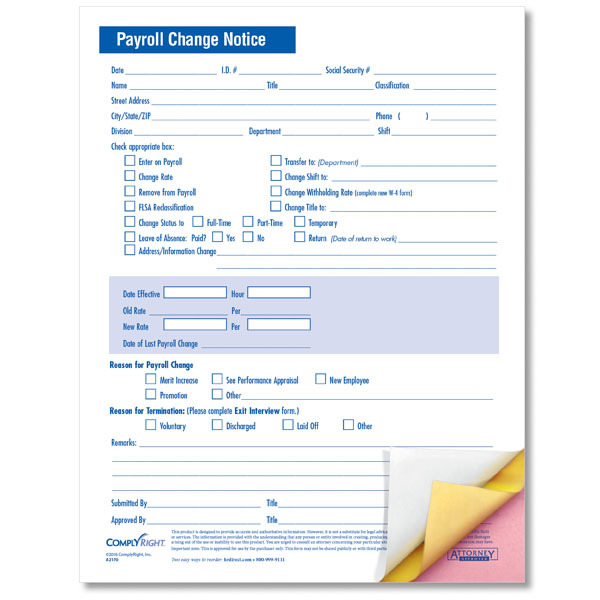 Our expertly designed Employee Payroll Change Forms gets the job done simply and thoroughly. This form collects all the necessary information to document any changes and serves as a tool to ensure all employees have updated, current payroll records. The carbonless form instantly provides three copies for supervisors and recordkeeping.